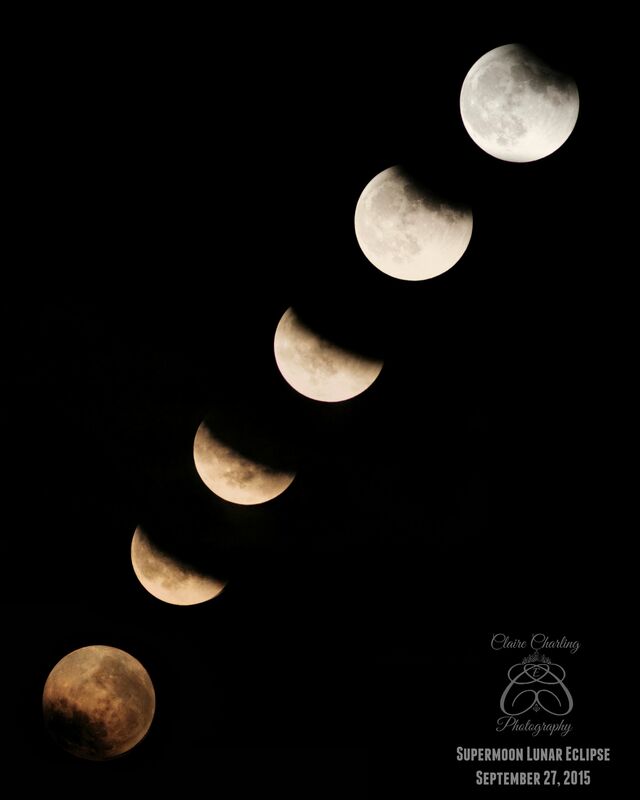 A little late, but here is a time-lapse photo I created of the second half of the lunar eclipse on Sunday evening. While there are several ‘super-moons’ each year in the summer months (when the moon appears larger than normal because of it’s orbit around the earth,) and there are also occasional lunar eclipses (when the earth passes in front of the moon, creating a red shadow,) it is very rare to have both occur at the same time. This is the first supermoon lunar eclipse in 32 years; the last occurred in 1982 & the next time it will occur won’t be until 2033. This lunar eclipse is the last of 4 that have taken place in the last 2 years: (4/15/14, 10/8/14, 4:4/15, 9/27/15). The next full lunar eclipse will not occur until 2018. The beliefs around the blood moon eclipse involve a time of drastic change or new beginnings. This is a time when the earth, sun & moon align for a brief time & open pathways to other realms or spirit worlds in many religions. Christians believe it is a time when Christ returns, some Native American tribes believe the moon is sick & the people must join together to bring it back to health, other cultures believe it is an ill-omen as it disturbs the normal order of things. Many cultures thought that this series of 4 full lunar eclipses would signify an ‘awakening’ or time of shift/change in the world. Unfortunately, in our city, the first half of the eclipse was very clouded over & hard to see. Finally about an hour after it had started, we were able to start to make out a hazy red blur & then the moon slowly emerged from the earth’s shadow over the next hour. I used a tripod, remote shutter control & my fully manual 800mm telephoto lens to capture these images. Next Now Offering a Fall Special!